Preparation: For visual aids, bring along two noninflated balloons. Use a marker to draw a face on each balloon: a proud face for the Pharisee in the story (maybe with a turned up nose and a scowling mouth), and a humble face for the tax collector (eyes closed, small smile). To make it easier for children to blow up the balloons, blow them up ahead of time and then deflate them before the sermon. I brought a couple of balloons this morning to help illustrate a story Jesus told—“The Pharisee and the Tax Collector.” Jesus told this story to people who thought they were better than everyone else. These people belonged to a group of church leaders called Pharisees; these Pharisees looked down on anyone who was not just like them. Jesus told this story: “Two men went to the Temple to pray. [Look at Pharisee several times during the following—and allow time for the balloon to get larger and larger.] One was a Pharisee, and the other was a dishonest tax collector. The proud Pharisee . . . prayed this prayer: ‘I thank you, God, that I am not a sinner like everyone else, especially like that tax collector! For I never cheat; I don’t sin; I don’t [think dirty thoughts], . . . and I give you a tenth of my income.’ But the tax collector stood at a distance and dared not even lift his eyes to heaven as he prayed. Instead, he beat his chest in sorrow, saying, ‘O God, be merciful to me, for I am a sinner’” (Luke 18:10-13 NLT). Our Pharisee looks much different from the tax collector now. (Let child hold up “Pharisee” balloon for all to see.) 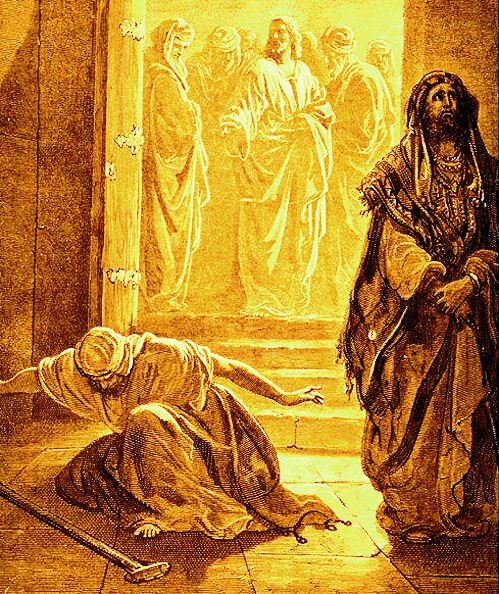 The Pharisee is all puffed up with pride, but the tax collector is just laying there not daring to even look up. Do you know what Jesus said next? Jesus said that God was pleased with this sinner (pick up limp balloon) and not with the proud Pharisee. For the proud will be humbled (pop or deflate “Pharisee” balloon), but the humble will be honored. (Inflate the other balloon, tie it off, and let child take balloon with him or her.) God raises up and honors those who admit they are sinners, but people who think they are better than others will be made humble. Prayer: Lord, we are sinners, but we know that you love us and forgive us. Thank you.